It has shaken the confidence of the new Europe. Oil crisesfuel shortagesstreet blockades and protests that had become commonplace during the 1970s oil shortagehave come back to haunt Europe once again. Over the past few weeksas the price of oil touched a 10-year high of us $35 a barrel -- the highest since Iraq's invasion of Kuwait -- truck and taxi drivers brought European capitals to a standstill. Truckers also blocked fuel refineries and depots. Fuel shortages immobilised the ukwith 90 per cent of Britain's petrol stations running out of supplies. 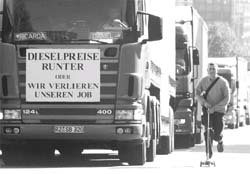 Farmers joined in the protests by picketing refineries in Germany and Britain. All of them were demanding total exemptions from fuel taxeswhich account for more than half the price of petrol in Europe. The French government was the first to give in to the protests and on September 9it offered a cut of us $400 million in fuel taxes over the next two years. Belgium and Italy have conceded temporary freezes in fuel taxes. British Prime Minister Tony Blairwho stood firm despite the raging protestsinsisted that the high price of oil was good for combating global warming. He stated that giving in to troublemakers was "not the way to make policy in Britainand as far as he was concernedwould never be". But there have been indications that he may be forced to comply with the protesters' demands. Other European Union ( eu ) governments have also announced their resolve not to reduce taxesciting political and environmental reasons. As increased fuel taxes have been accompanied by reductions in other taxes in most European countriesgovernment budgets are increasingly dependent on revenues from fuel. In Indiaon the other handthe nation's budget suffers from huge subsidies on fossil fuels. Currentlythe government subsidy on oil is us $12-13 per barrelresulting in a budgetary deficit of Rs 90crore. With the current colossal mismanagement of Indian oil and fossil fuel resourcesfurther upheavals can be expected in the future. Says Bibek Debroydirector-researchRajiv Gandhi FoundationNew Delhi: "If immediate steps are not taken by the governmentthe oil pool account deficit will touch record levels of Rs 200crore by the end of this financial year." Some estimates say that this figure could reach even Rs 240crore ( see section: India: On slippery ground ). The European crisis is largely the result of creeping increases in oil prices over the last six months topped by the market panicking over record low stocks of heating fuel in usa . With the coming of winter in the Northern hemispherethere are fears that refineries will not be able to meet the demand for heating fuel. If the winter turns out to be severesome analysts believe that the price of oil will touch a new high of above us $40 a barrel. Rising economic growth is also said to be responsible for pushing prices alarmingly high. In June this yearmany developed nations asked the Organisation of Petroleum Exporting Countries ( opec ) 'cartel'to intervene and increase oil supply. Subsequentlyopec increased output by 8000barrels a daybut this has had little effect in bringing down prices. opec has been branded the 'villain' of the crisis. The us secretary for energy Bill Richardson put the pressure on opec leaders to deliver an increase in oil supply saying that the us was ready to "exercise all options" to make opec comply. But whatever the opec doesit is always seen as a 'villain' in the eyes of the industrialised world. In times of 'peace'it is blamed for keeping the world in the oil trap and hampering the development of renewable forms of energy. The fault lies not with opecbut rather with large industrialised economies such as usawho keep fossil fuel prices low and unsustainable for political reasons. While Europeans are demanding cheaper fuelirony has it that governments from around the world met in LyonFrancerecently to negotiate how to reduce the world's consumption of fossil fuelsreduce carbon dioxide emissionsand hence avert the dangers of global warming. This was a week-long meeting of the subsidiary bodies to the un Framework Convention on Climate Change ( unfccc )and its Kyoto Protocolunder which industrialised country governments have agreed to reduce their greenhouse gas emissionssuch as carbon dioxideby 5.2 per cent compared to their 1990 levels. Ironicallyopec has often been blamed in the past for hampering any move to reduce fossil fuel consumption. Some analysts feel that this blame is unwarranted. A recent editorial in The Economist says that the group should be congratulated for risking its own business interest by increasing oil prices that dissuades people from using petrolinstead of being branded the "villains of the piece". "The Stone Age came to an end not for a lack of stones and the oil age will endbut not for a lack of oil" says Sheikh Ahmed Zaki Yamaniformer Saudi oil minister. This prophecy has been backed by recent research by the us -based Worldwatch Institutewhich predicts a 'micropower' revolution using more environment-friendly fuel cells and gas turbinesevery bit as dramatic as the revolution that hit the world's telecommunications industry in the 1980s. But this revolution can be seriously slowed down by subsidies and distorted taxes on energywhich act as perverse incentives to carbon-based energy. But global warming and local air pollution are two of many reasons why the world should stop depending on fossil fuels and focus on a transition to renewable technologiesrather than following the us example of extremely low fossil fuel prices. Currentlythe price of fossil fuel is kept artificially low in many parts of the worldincluding the usbecause large amounts of taxpayer's money are used to subsidise coaloil and gas. But low fossil fuel prices do not take into account the non-renewable nature of the resourceor the health and environmental costs associated with its use. Cutting subsidies and levying taxes on fossil fuel are the two most direct ways of making economic growth environmentally sustainable. High fuel taxes were the response to the oil crisis of the early 1970swhen they were seen as necessary to promote fuel efficiency and relieve congestion. Todaythe case for high taxes is stronger than in the past because the problems related to global warming and air pollution have increased. The rationale given for the continuous increases in road fuel costs since 1993 in the ukfor instancewas to bring down carbon dioxide emissions. This strategy seems to have worked. Compared to rising incomes and the fact that motoring costs have stagnated despite the fuel taxestraffic growth has only gone up by 1 per cent over the last two years. Subsidies and low taxes on fossil fuels also make renewable technologies such as solar and wind power seem relatively more expensive and non-viableeven though their prices of these technologies have fallen in the past few yearsand they have made remarkable technological advances. The three oil shocks in the early and late 1970s and 1990swhen oil prices tripled over a short whileresulted in increased Research and Development ( r&d ) investments in industrialised countries for non-carbon technologies (see graph: Waking up to a crisis ). In the 1970sfor instancethe r&d budget for renewable forms of energy in industrialised countries increased tenfold. The European strategy of high taxation is therefore a good oneand particularly so if the revenues from these taxes were ploughed back into research and development of non-carbon technologiesto reduce dependence on oil. Giving in to protesters' demands and slashing fuel taxes nowon the other handwould rob credibility out of the new European Union ( eu) momentum of high-energy taxation. Spanish economy minister Rodrigo Rato has warned that the eu must not be tempted to bring down fuel taxes because it is important to stick to the long-term goal of reducing economic dependence on oil. Since the early 1990snine out of the 15 eu members have adopted high taxes on the consumption of energy produced by fossil fuel. The last decade has seen a new trend in energy taxation in Europewhich is to reduce taxes on labour -- income tax or social security contributions -- while increasing taxes on pollution. This green tax reform has swept through Europe from Scandinavia to The Netherlands and Denmark and since 1998to Germany and Italywhile similar taxes are on the anvil in Britain and France. Todayenergy taxes account for about 11 per cent of total eu taxes as compared to 5.2 per cent in 1993. They are expected to help reduce greenhouse gas ( ghg ) emissions. Germany has been on the forefront with green tax reforms starting in 1999. It aims to take away 2.3 per cent of the burden of social security contributions and increase taxes of dieselheating oilgas and electricity by the same amountso that the tax burden of the business sector will remain unchanged. The price of heating oil is estimated to rise by 10 per centelectricityby 7-8 per cent and gasby 6-7 per cent. The green tax reform serves to shed the tax burden from the corporate sector and the labour forcewhich many see as essential to encourage eu business to grow and catch up with competitiveness in the us . The overall German tax burden will decrease by 1 per cent of the German gross domestic product as of next year. Five years from nowthe German corporate tax rate is planned to decrease to 25 per centwell below usa 's 41 per cent. SimilarlyFrance has pledged ready to cut the corporate tax rate by 10 per centand cut income tax especially for low earnersto encourage higher employment. By increasing energy taxes while decreasing labour and corporate taxeseu finance ministers have locked the cause of the environment together with the aim of maintaining a balanced budget. In other wordswhile taxes on labour are cut to boost competitivenesshigh-energy taxes serve to bring new revenue into the budget. This is the economic rationale behind eu minister's stiff refusal to concede cuts in the fuel tax. Protesters in Germany had it spelt out that fuel tax will stay for budgetary reasons. "There's no more (tax relief). Germany is not going back into the debt trap" said Hans Eichelfinance minister. Judging by the increasing use of the terms 'climate change''environmental tax' in policy statements it seems that the environment and climate change in particular are moving up on the eu agenda. For the first time in 1998a "statement of intent for environmental taxation" accompanied the uk budget proposal for 1998. The uk Fuel Levyto be introduced in April 2001has been renamed as the Climate Change Levy. The French tax reform aims to bring emissions of carbon dioxide down to 1990 levels by 2008. And the Italian energy taxesscheduled to take effect in 1999were intended to reduce carbon dioxide emissions. Howevera striking omission of the green tax reforms across eu is that there is no information on what are the levels of taxes that would produce the needed reductions in ghg s. What most countries arein factstaging are trial and error experiments of increasing pollution taxes to what is felt to be the politically acceptable ceiling. None of the countriesapart from Denmark and Franceare attempting to calculate the effect of the carbon tax on the levels of carbon dioxide. Denmark aimed to decrease its ghg emissions by 5 per cent through a tax that moved 2.5 per cent of tax revenue from labour taxes to energy taxes. The French tax reform is estimated to reduce carbon dioxide to 1990 levels by 2008. The reform has grouped all environmental taxes under one umbrella tax called the general tax on polluting activities. The tax base is to be broadened and rates are to be increased from 2001 onwards. The burden of the tax will be offset by a reduction in payroll taxes and the revenue will be used to subsidise a 35-hour week. Howeverin order to make taxes work as a ghg reduction strategythe industry will have to be brought into the carbon tax net. The biggest problem of the European energy taxesapart from the ukis that industry is exempt from the tax for political reasons. The biggest fish in the tax base are exempted of 80 per cent of the energy tax on averageaccording a French ministry study. The result is a striking failure of the tax strategy to curb industrial ghg emissions. In Swedenthe industry actually increased its fuel consumption by 20 per cent in one of the years following the introduction of a carbon dioxide tax because it was exempted from paying the tax. The Netherlands refused to tax the industryfearing that business would just shift to neighbouring countries. Even has restructured its carbon dioxide tax since 1996 so that the heavier the use of energythe lighter the tax rate. The uk green tax reform stands out for being the only one that targets the energy intensive industry and does not impose any energy tax on households. The uk climate change levy is planned to take effect in April 2001. Most of the tax levied on the use of energy by businesses will be recycled back to them through a cut in employers' national insurance contributions. In negotiating the tax with the industrial lobby the uk government had to come up with a reduction of 40 per cent on the original tax level accompanied by a complex package of concessions. It is likely that the political difficulty of introducing environmental taxes will make such complex packages more common in the future. The industry's main argument against an energy tax is that the loss to the economy from high energy prices would be detrimental. Howeverstudies of the effects of energy taxes on competitiveness do not show that recessions and unemployment would necessarily rise with high energy taxes. Dismantling the fossil fuel sector would like any other economic restructuring harm some and benefit others. Areas with concentrations of industries relying on fossil fuel such as The Ruhr in Germany or Manchester and Liverpool in Britain would suffer. Howeverother studies predict that economic growth would continue to increase jobs following the introduction of green tax reform. One such study predicts the creation of 750new jobs in Germany following the 1999 tax reforms. The Danish tax reform was estimated to have left the job market unchanged if not slightly better off. The task of an eu energy tax to combat climate change would be lop-sided if the eu continues to shower the fossil fuel sector with enormous subsidies. Dismantling subsidies is easier said than doneespecially since they are high in usa and Japan -- eu 's large trade partners -- but unless they are cut any green tax reform will only be giving with the right hand to steal it with the left. A 1997 study by the Free University of Amsterdam calculated the total subsidies to the fossil fuel sector in the eu to be in the order of us $ 10 billionalmost all of which are for coal -- the most polluting among oil and gas. By comparisonrenewable energy only receives us $ 1.5 billion per yearwhich is about 10 per cent of the subsidies for coaloil and gas. Although the oil crisis has everyone tied down temporarilythe eu has a great chance of passing a common energy tax. A proposal to extend the existing minimum excise rates on oil products to all energy products across the euhas now won over 14 of the 15 member states. The Monti proposalas it is knownwas introduced by the European Commission in 1997 and intends to increase the energy taxes gradually in the future. The eu thereforehas a unique opportunity to set a new trend in the global energy policy to combat the greenhouse effect and help phase in renewable forms of energy. If it abandons this proposal because of the street protestsopec will have to be counted on in the future to deliver the message more clearly. Oil and fossil fuel are unsustainablewhether one is thinking of air pollution and its high health coststhe damage to the ecosystem and the inevitable stock depletion. Consumers must learn to live with these harsh facts and the surest way to deliver the message is to keep the final price of fossil fuel highby abolishing subsidies and raising taxes on the energy produced by fossil fuel. The first United Nations Conference on Human Environment in Stockholm, Sweden, in 1972 led to a spate of comprehensive legislative measures for protecting the environment. India being one of the signatories to the Stockholm declaration enacted several laws and also amended the Constitution in 1976. Two important changes were made, which made the state and the citizenry responsible for protection and improvement of the environment. In the 1970s-80s, five major acts were enacted by the Indian Parliament, which included the Environment Protection Act (1986). This was to be the umbrella legislation designed to protect the environment as a whole. But environmental concerns in development were expressed for the first time in the Fourth Five Year Plan (1969-70 to 1973-74) in the section on "long term perspectives", where the need to introduce environmental aspects into development planning was recognised. The Fifth Plan and the Seventh Plan took some concrete action to incorporate these concerns while assessing the economic and technical feasibility of a project, but there was still no legal requirement for eia s on major projects. eia s for large-scale projects were made compulsory only in 1984. But implementation took a long while. Ten years later, in January 1994, mef issued the Environmental Impact Assessment Notification, which made eia clearances mandatory for "expansion or modernisation of any activity (if pollution load is to exceed the existing one) or a new project listed in Schedule I of this notification". Schedule I listed 29 industries, including mining, construction of highways and chemical fertilisers. The notification includes a provision for public hearings to be held before a project is given environmental clearances. The notification was further amended in April 1997. The process of hearing: Under the notification, the company seeking environmental clearance has to submit to the concerned state pollution control board ( spcb ), among other things, an executive summary containing the salient features of the project both in English as well as local language and details of effluent discharge. The spcb will then fix the time, date and venue and showcase a 30-day notice for environmental public hearing. This should be published in at least two newspapers widely circulated in the region around the project, one of which should be in the vernacular language of the locality concerned. The notification states, "All persons, including bona fide residents, environmental groups and others located at the project site/sites of displacement/sites likely to be affected can participate in the public hearing. They can also make oral/written suggestions to spcb ." "Person" means anyone who is likely to be affected by the grant of environmental clearance; any person who owns or has control over the project with respect to which an application has been submitted for environmental clearance; any association of persons whether incorporated or not likely to be affected by the project and/or functioning in the field of environment; any local authority whose limit is within the neighbourhood, wherein the project is to be located.  Not more than three senior citizens of the area nominated by the district collector. The public, meanwhile, is provided access to the executive summary of the project at the district collector's office; district industry centre; in the office of the chief executive officers of zila parishad or commissioner of the municipal corporation/ local body as the case may be; head office of the concerned spcb or its regional office; or in the environment department of the state government dealing with the subject of environment. Based on the public hearing, the spcb gives a No Objection Certificate ( noc ) for air and water to the company concerned. Getting clearance: As per the January 1994 notification on Environmental Impact Assessment of Development Projects, the application made by the company concerned for environmental clearance should be accompanied by a project report which should, among other things, include an eia report or environmental management plan, details of the public hearing and noc from the pollution control board. In the case of site specific projects -- such as mining, pithead thermal power stations, and hydropower -- project authorities have to intimate the location of the project site to mef while initiating any investigation and surveys. The mef then takes a decision regarding suitability of the proposed site within a maximum period of 30 days. The reports submitted by the company concerned is evaluated and assessed by the Impact Assessment Agency ( iaa ) and if deemed necessary it consults a committee of experts, constituted by iaa or any authorised body under the Central government. The iaa then prepares a set of recommendations based on the assessment of documents and data furnished by the project authorities supplemented by data collected during visits of sites of factories, if undertaken, and details of public hearing. Regarding submission of eia s, the notification says that "as a comprehensive eia report will normally take at least one year for its preparation, project proponents may furnish Rapid eia report to iaa based on one season data (other than monsoon), for examination of the project. Comprehensive eia report may be submitted later, if so asked for by the iaa ." According to the law, the assessment is to be completed within 90 days of receipt of the required documents from the project promoters and completion of the public hearing. The decision is conveyed within 30 days thereafter. Till the environmental clearance is received, no construction work, preliminary or other relating to setting up of the project or site clearance is to be undertaken. However, if no comments from received from the iaa within the time limit, "the project would be deemed to have been approved as proposed by project authorities" (see diagram: The route to environment clearances ). The notification ends on a note on the need for correct information. "Concealing factual data or submission of false, misleading data/reports, decisions or recommendations would lead to the project being rejected. Approval, if granted earlier on the basis of false data would also be revoked. Misleading and wrong information will cover the following: false information, false data. engineered reports, concealing of factual data and false recommendations or decisions," it states. Is the law enough? At the first instance, the laid down procedure may seem to be a transparent, ideal and effective method that takes people into confidence vis-a vis the grant of environmental clearance to a proposed project. However, point out experts, few experiences of such hearings have made it very apparent that the government machinery and industrialists very well know how to make this seemingly ideal method hollow and ineffective. In the early 1990s, the Birla-led Indo-Gulf Fertilisers Limited was scouting for land near Mangalore to establish a copper smelter plant. Tokur and surrounding villages near Baikampady were proposed as a possible site, an area full of paddy fields and plantations. In 1994, the Dakshina Kannada Zilla Parisarasakta Okkoota ( dkzpo ) -- a district environment federation of people's organisations at various levels -- argued on the grounds of inappropriate siting and in the public hearing, a provision of which was there in the 1994 notification. On the basis of the hearing, the government decided not to clear the project. Initial euphoria, however, soon gave away to a string of disappointments. Well - connected by rail, road, water and air, Dakshin Kannada district of Karnataka is an investor's haven. But the district -- which is blessed with the Arabian Sea, the verdant Western Ghats and where rivers, streams and estuaries abound -- is also plagued with a host of controversial 'development' projects (see table: Flashpoint Karnataka ). 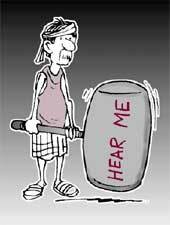 But the system of public hearing has continues to 'used'. Whether the people are being heard is a different story altogether. Power struggle: Consider Cogentrix Incorporation, usa , which finally pulled out in December 1999 after hogging the limelight for seven years. Cogentrix's India project, Mangalore Power Company ( mpc ) -- the company still exists -- is a us $1.3 billion joint venture with China Light and Power Company of Hong Kong. The 1,000-mw coal-fired power plant is to be located at Nandikur-Padubidri near Mangalore. Ever since the state government signed the Memorandum of Understanding for the power project in 1992, local communities have strongly resisted the project on grounds that the proposed location is an environmentally-fragile estuarine zone. "Even within the government, some officials spoke against it, yet the government went ahead with the project," says M K Ramesh, head, Centre for Environmental Education, Research and Advocacy at the National Law School of India University, Bangalore. Saldanha says in 1995, the state minister of forests was Siddanha Gowda. He called a filmstar and the chairperson of Karnataka spcb . The three went to Mangalore, sat in the Circuit House, called for a few more people and said this is a public hearing. When the people got wind of it, they protested. The meeting was called off saying a 'joint' hearing would be held later. "But based on the hearing, a noc was given by kspcb in 1996 and the mef cleared the project, too," says Saldanha. Cogentrix finally pulled out of the project a year ago. Interestingly, the reason for Cogentrix walking out of the project is not public protests. According to Ranjan Rao, the Karnataka hc in early 1998 ordered a Central Bureau of Investigation ( cbi ) inquiry based on allegations of corruption levelled against the promoters by consumer activist Arun Agarwal. Negating wide public opinion favouring an inquiry, the state government went on appeal against the hc decision in sc , which stayed the order and reserved judgement after several hearings. But Cogentrix pulled out soon after. "Nobody had stopped their project from coming through and there was no stay order. They could have gone ahead but they preferred not to because they did not want a cbi inquiry. So it is a wrong notion that they have walked out because of protests," says Rao. Trouble in the pipeline: Another storm is brewing not just in Dakshin Kannada but in six other districts too is over a proposed petroleum pipeline between Mangalore and Bangalore. 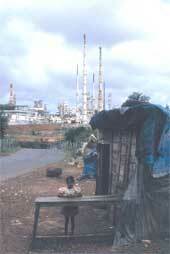 Mangalore Refineries and Petrochemicals Limited ( mrpl ) was one of the first mega-industries to be set up in the region. Hindustan Petroleum Corporation Limited ( hpcl ), which also holds equity in mrpl , markets its products. The controversy is over the proposal to lay a 364-km underground pipeline between Mangalore and Bangalore to transport petroleum products at the cost of Rs 800 crore. The pipeline will pass through 243 villages in 17 talukas across seven districts -- through the mountains of the Western Ghats and prime agricultural land. This, among many other things, has enraged farmers and environmentalists alike. Project proponents maintain that the pipeline is the 'least harmful' mode of transportation and will also minimise the risk and burden of transporting by trucks and tankers. So far, five public hearing have been held. In the Bangalore hearing on May 20, 1998, under pressure, the deputy commissioner asked kspcb to make all the required documents available to the public. But, of the executive summary provided to the people, says Somnath of the nst -Belthangady, "It was full of factual errors and inadequate information. It did not even include a map indicating the route of the pipeline, only a general direction and some names of places." dkzpo has demanded that the current route earmarked for the pipeline be changed because it passes through prime agricultural land and forests. "When the present route was drawn no one was consulted. When people asked, they were told that it was a Central government project," says Manohar Prasad, a journalist and member of the district public hearing committee. dkzpo has also demanded a detailed consultation with the village panchayats , zilla panchayats and affected people. Thereafter, a fresh public hearing should be held. Currently, according to Somnath, the survey is still going on. Barging in: So far, three barge-mounted power plants ( bmpp s) have been proposed on the Gurupur river that drains into the Arabian sea at Mangalore. Suresh Prabhu, during his tenure as Union minister for environment and forests, cleared the first one, Tanneerbavi, on an "experimental basis". "How can you commit a blunder on an experimental basis?" questions Upendra Hosabettu, another leader of a fishing community. The mandatory public hearing was not conducted for this project, the 170-mw plant of the us -based Chicago Power Company and currently under construction. The rapid environmental impact assessment ( reia ) is also erroneous. "Contrary to what has been cited, the site has productive lands with paddy fields and the nearest human settlement just half-a-kilometre away," says Yatish Baikampady, a leader of a fishing community in Dakshin Kannada. Currently, the construction of the plant is going on in full swing. The second proposed bmpp is at Bengre. Straddled between the river Gurupur on one side and the mighty Arabian Sea on the other, Bengre is a strip of land inhabited by some of the most strong-willed people. It is also here that the Netravati river, the lifeline of Mangalore city, meets Gurupur before the two drain into the Arabian. Perhaps, for all this reason and more it hasn't been able to stay off the limelight. It is a do-or-die battle for the 20,000-odd people who inhabit the Bengre. Smith Cogeneration of the uk has proposed the 170-mw power plant. A public hearing was called on November 6, 1998, but postponed for November 23 "due to unavoidable circumstances". The hearing was one of the biggest ever, with more than 5,000 people attending it, says Ranjan Rao. "The reia was erroneous but officials dismissed it as typographical mistakes," says Ranjan Rao. In spite of all this, it has got kspcb clearance. But the company officials have not shown their face ever since. "What is stopping them from coming?" asks Shantaram, a local fisherfolk. Undoubtedly, it is the might of the fisherfolk they fear, well-organised under the Mogaveer Mahajan Sabha, an organisation of fishing communities. In Bengre, they have vowed not to let project promoters or government officials anywhere come close to their village. The third in the series is a 195-mw plant by Euro India Canara Power Company. The public hearing for the project was held on December 1999. A large number of people turned up and voiced their apprehensions, but nothing is known further about it. The dredging to be undertaken for the project would include an estuary, which serves as a breeding ground for fishes, says Baikampady. W hen you cry, in fact cry hoarse, and yet not be heard, what do you do? Experts contend that going to courts should be the last straw. "Firstly, there is a kind of misplaced loyalty towards the formal justice delivery mechanism as the be-all-and-end-all," says Ramesh. Secondly, there is over-reliance on them. As a result, the higher judiciary is choked with cases, some of which are frivolous. An alternative is to strengthen the public hearing of the projects at the formulation stage. This would also help the investor, who would be saved from the public project delays and cost overruns after the project has started. But this can happen only if the public hearing scrutiny of the project is effective and transparent. However, in its present state, the public hearing notification is a toothless device, says Rao (see box: Loopholes aplenty ). For them to be successful, comprehensive guidelines in consultation with all those who are involved in the process are needed. This is particularly important because in India, the pressure on the environment is very high and a development project will impact on the local environment and affect livelihoods. Protest is the only weapon people have to stall projects. Unless there is an environmental governance system that allows people the ability to intervene in project siting, design and, most importantly, monitoring. But with the unholy alliance beween industry and officialdom persisting in this non-transparent system, public protest remains the only weapon in their hands. The most important is recognising the right/ access to information, which ensures public approval and also imposes a sense of environmental accountability on the companies concerned. Secondly, there is a need to make eia more than just a "formality" and also weed out possible chances of corruption in the preparation of the report. "Right to know" is critical in environmental matters. It is necessary for people's participation in decision-making and public approval, firstly because it is important they are made aware of the effects of the project on their social and economic well being and, secondly, to promote transparency in the decision-making process. The right to information is a fundamental right, which is set in Article 19(1)(a) of the Constitution. Besides, in 1988, the Supreme Court in the Reliance Petrochemicals vs Indian Express SCC 592 held that the right to know is a basic right, which people at large have in order to be able to take part in participatory development in industrial life and democracy. The eia notification on public hearing is also a step forward towards this direction. There is, however, a lack of awareness of these rights to begin with. "In any case, whose duty is to make people aware of the basic rights -- ngo s or the government?" asks Hari Babu of Equations, a Bangalore-based ngo . Even if they are brought under the purview of public hearing, there is no guarantee that the project promoters will provide details of the proposed project to the public. An example is the bmic case, where the proponents refused to divulge anything apart from the executive summary. Even the High Court ( hc) refused to make available relevant documents, says Ranjan Rao. At the same time, the Gujarat hc has passed an encouraging order. On March 2, 2000, the court laid down guidelines for public hearing, which includes access to all the relevant documents. "Unfortunately, the decision does not bind Karnataka and unless the sc or hc passes some such order we will not have access to the same," says Rao. Karnataka is at present drafting a Right to Information Bill, which will be placed before th Cabinet for approval. It will be the fourth Indian state to have an exclusive legislation on Right to Information. A significant aspect of the bill is that information sought should be provided within 15 days, compared to 30 days as in the Central draft Bill. Another provision is that every public authority is expected to make a voluntary disclosure of information relating to cases affecting public interest. The Karnataka draft Bill also provides for a penalty in the form of a fine of Rs 2,000 on any competent authority or official for refusing to disclose information sought or for providing false or inaccurate information. But whether the eia , a document of a private company, will come under the purview of the act remains to be seen. eia is an exercise to evaluate the probable changes in the various socio-economic and biophysical characteristics of the environment, which may generally result from a proposed programme. But in India, says Hari Babu, "The assessment is usually manipulated in order to make sure the project gets a go ahead." That corruption is involved is obvious though proving it would be difficult, says Ranjan Rao. "At a training programme an mef official once said it is obvious why there is such a great demand to be in the iaa division of the ministry. It was because of the 'incentives' available there," he says. A good case in point is the eia of the proposed Dandeli Mini Hydel ( dmh ) project downstream of Supa Dam on Kali river in Uttar Kannada district. Ernst & Young, an American consultancy company, was given the task of preparing the eia . However, instead of wasting manpower and money on conducting field studies, the company reproduced the eia of Tattihalla Augmentation Scheme ( tas ) prepared by Bangalore-based Catchment Studies and Environmental Management's ( icsem ) in 1999. The only "earnest" thing they have done is changed the name of the dam -- dmh in place of tas . But despite this being brought to the notice of kspcb , the public hearing was held on August 21, 2000 and the project cleared. Despite all the discrepancies, environmentalists hail the system of public hearing as no doubt a very innovative one with far reaching consequences. "This is the only opportunity we get by law. Sadly, it is only limited to hearing grievances, it does not talk about redressal of problems," says Ramesh. At present, it is more of a formality. But guideline have to be drawn especially because, unlike in the past, development projects have become an every day feature, says Hari Babu. So, the question is one of extent. The process has to give people an opportunity of following up on the action taken about their grievances. They ought to have a right to veto public hearings if they remain dissatisfied. The process has to be made accountable to the people, and not merely to the dm and the officials of the spcb . To this end, public hearing is just the beginning. To make industry really accountable to the people, they need to be involved in monitoring of the project, eia , and even in the follow up of industry's environmental performance. "Environmental justice is something you have to seek, not just in the court of law. It is not about conflict resolution. It is about anticipating problems, consensus building, meeting the needs of everyone and learning to live with nature," says Ramesh. One way of ensuring this is through community monitoring bodies, he opines. Once the company concerned realises that there is no scope for survival unless it has the confidence of the people amid whom it has to reside, the company has no alternative. Partnership with the people becomes necessary for survival.